Got a new one from Electric Cowbell, and like all of their releases, it's about the research yo want to do as the audience. Like Moniker Records, there's always an interesting story behind each performer, each release, what leads up to this single is as important as what's on the record. That's true for this one from Cheick Hamala Diabate, who is a world renowned master of the Ngoni, which is somewhat related to the banjo. This single combines the traditional sounds and practices of Mali with absorbing the past decade of rock in the US, and combining them together. On the A-Side, "Tagamba" is a great example of this blending of cultures...and even era's. The high resiter Ngoni, sort of reminds you of a mrimba with that similar metallic 'plink' sound. Cheick starts the track solo, in an intricate finger picking style, a rolling rhythm comes up immediately behind, full of a muted brass section, working in tandem with this rigid rhythm. For me, it's got those same Tortoise moments from their self titled album, the sections when they were also drawing together those jazz and indie influences. This is a very contemporary sounding percussion section with a heavy emphasis on the 4/4 beat, the drums not straying too far from this heavy structure. Cheick is improvising on top of this foundation, making the case for this instruments completely western abilities. Then suddenly this track goes completely indigenous-funk, with Cheick delivering his vocal in multiple distinct layers which emulate that chorus of folks who would be singing along. A literal sounding combination of these varied styles and their differences, but maybe providing some kind of blueprint for some new innovation. The B-Side, "Sigi Diya" sounds like it starts out with an electric version of the Ngoni, building up layers of what sound like loops, another really interesting combination of traditional and contemporary. Something like The Books, it's jarring to expect to hear that in a certain way. You start to realize the preconceptions that come with this sound and how they're broken. Also after reading from EC what this track is about I start to wonder if there isn't some correlation somewhere between certain ranges of human vocal and emotion irregardless of meaning and context. There's no denying when you get to sit down with these records you're going to be asking yourself these kinds of questions. Burst of horns in a huge complex mix of rhythm that somehow keeps shifting, in what I imagine must be like in those neverending sessions for nobody but themselves, even make it on a record. The bassline, conga, xylophone...nothing sounds to be obviously working together, they may as well be captured samples, played in this precise way. It's hyptnotic, the complex drums building to overwhelming if it wasn't also working out this heavy groove at the same time. Lots of jazz like expressions that can't be planned. Cheick Hamala Diabate is a West African historian, now living in Washington DC, in the Griot tradition, and a world-recognized master of the ngoni, a Malian traditional instrument. He has successfully fused the traditional rhythms and vocals of his ancestors with the more electric, American sounds he has absorbed over the past decade living in the US. Both of these tracks have Griot teaching messages and are sung in Manding (seems to be a mother language of Bambara) from Mali. For example, Sigi Diya on side B, is a message for people to listen to each other, be understanding of each other, respect each other and trust each other. We’re happy to help Cheick promote this message on 45RPM vinyl. The band on these tracks is well-oiled from holding down a weekly residency at the nightclub Bossa in Washington, DC, and the groove is thick and sure to go off on any dance floor with live humans in the house! 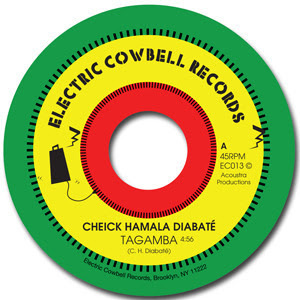 We love re-issues of West African music by labels like Analog Africa and Soundway but it’s refreshing to have new vinyl available from a current and relevant artist such as Cheick Hamala. Comes in medium weight 7″ Brown Paper Sleeve with hand-made stamp.